EZswitch® is an ATM/debit middleware system that provides an interface to a core banking system and an interface to an ATM/EFT network1 that supports an on-line authorization channel for ATM and debit issuer transactions. The solution may operate on either a CSFi-supplied server or a virtualized (VMware) environment. The core system will perform transaction authorizations using the current balances and when unavailable EZswitch can perform stand-in authorization using a combination of card limits and a positive balance file (PBF). The PBF can be updated using one of two methods: the first method is through a real-time update as ATM/debit issuer transactions are processed and the second method is a full update from the core system that may be performed multiple times throughout the day. EZswitch® is an ATM/debit middleware solution that provides an interface to the core banking system and an interface to an ATM/EFT network who supports an on-line authorization channel for ATM and debit issuer transactions. The system may operate on either a CSFi-supplied server or a virtualized (VMware) environment. The core system will perform transaction authorizations using the current balances and when unavailable EZswitch can perform stand-in authorization using a combination of card limits and a positive balance file (PBF). The PBF can be updated using one of two methods: the first method is through a real-time update as ATM/debit issuer transactions are processed and the second method is a full update from the core system that may be performed multiple times throughout the day. On-Line Card Maintenance (OLCM) interface. supports real-time card maintenance updates performed on Precision and sent to EZswitch. EZswitch® is an ATM/debit middleware system that provides an interface to the core banking system and an interface to an ATM/EFT network who supports an on-line authorization channel for ATM and debit issuer transactions. The system may operate on either a CSFi-supplied server or a virtualized (VMware) environment. The core system will perform transaction authorizations using the current balances and when unavailable EZswitch can perform stand-in authorization using a combination of card limits and a positive balance file (PBF). The PBF can be updated using one of two methods: the first method is through a real-time update as ATM/debit issuer transactions are processed and the second method is a full update from the core system that may be performed multiple times throughout the day. EZswitch offers several features and options to choose from. 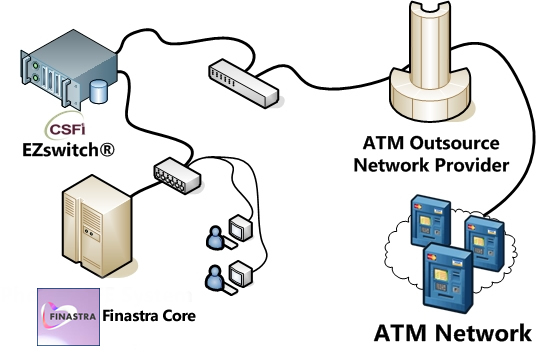 The base system provides standard functions including on-line ATM/debit issuer authorizations, real-time on-line card maintenance (OLCM) updates (for Precision only), single point of card maintenance entry where a card maintenance batch file (CMBF) is transmitted to the ATM/EFT network, and stand-in authorization using a positive balance file (in addition to using card limits). Optional added features include system-wide alert notification, multi-institution support, multiple ATM/EFT network connections, and more. EMV chipcards are on the fast track to become the new standards in the United States. Find out how CSFi’s EZswitch software has been proven as a reliable solution to handle EMV issuance, acquiring and issuer processing for countless financial institutions. CSFi provides project coordination, system setup, training, and remote live conversion assistance. In addition to the system parameterization and setup, CSFi also assists customers with certifying with the ATM/EFT network, including transaction processing and sending the card maintenance batch file. CSFi provides technical support services using the Comprehensive Action and Resolution Environment (CARE™) plan that includes access to CSFi’s technical support during normal business hours. In addition to the CARE™ plan, customers may subscribe to an After Hours Support plan (Bronze, Silver, or Gold). TotalCARE™ offers system diagnosis and performance analysis professional services. The base system provides a real-time interface for transactions sent from an ATM/EFT network to a host authorizing system for a single institution with a single authorization interface. Reconciliation subsystem3 (requires raw data file sent from the network) New! On-demand ATM/EFT network denial rules (a new CSFi client application) New! ATM inactivity status updates4 New! System health check monitoring New! Version 3.12 transaction processing engine (rules-based fraud detection and prevention ready) New! Support for multiple host authorizer connections and multiple institutions. Support for connecting to more than one ATM/EFT network. FraudBlock™ real-time fraud detection and prevention system. New! View the full list of supported network/switch interfaces. The ATM/EFT network’s CMBF format must be supported. Requires a raw data file from your ATM/EFT network. Some solutions require an upgraded version of the database software.